What Is the Purpose of Metal Containers? 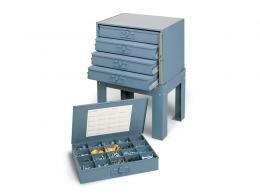 Many workplaces make use of items that need to be organized and stored in a durable container. 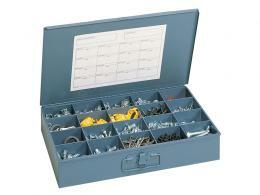 Our metal containers are perfect for storing things like nails, screws, tools, and much more. 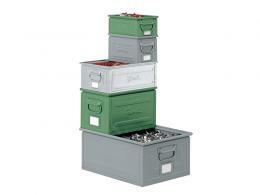 This section has a variety of metal containers that are all durable and will last for a very long time. The bins we offer are great for putting on shelves because they have lowered fronts, so it's simple to reach inside and grab an item out of them. They also have spots on the front where a label can go, and they are also stackable. 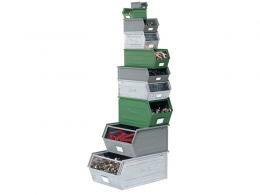 The same sized bins can stack on top of each other, and smaller bins can stack perpendicularly on top of larger ones. 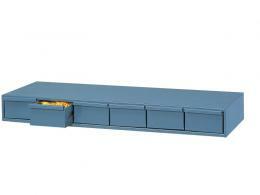 Drawer units are also excellent for a workplace where someone needs to have access to a variety of accessories that they don't want to keep exposed at all times. 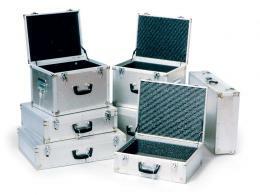 Metal transit cases are also perfect for those who need to transport valuables and don't want them to be damaged during the transportation process. They have foam interiors for maximum safety. Where Can Metal Containers Be Used? Our containers are going to be found in a variety of places, because they are so useful in many different situations. The bins we offer are great for keeping in a workplace, but they can also be used in a garage at home to keep track of smaller items as well. The drawer units are also great for any mechanic to keep on hand, but they are also great for someone to keep at home as well. The metal drawers are also useful in so many work situations because they are durable and will not be affected by anything that gets put inside them. Many people worry about damaging their drawers because they put metal objects inside of them, but this is not a problem that you will need to worry about with our metal drawers. Our metal transit cases also have areas where they can be locked so the wrong people can't get inside of them. We offer at least a one-year parts and labour warranty on our metal containers, and they will also be shipped to your home or work establishment for free. We also offer a price match guarantee on most of our containers.